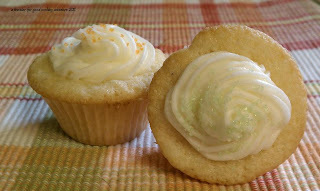 This was part two of my "gourmet" cupcake adventures last month. These were the mini cupcakes I made with the leftover batter. I am convinced that mini is the way to go. More people are likely to indulge when it's small. Mix together flour, nuts, baking powder and salt. In a large bowl whisk together sugar, oil and eggs until smooth. Alternately beat in flour mixture and eggs, with three additions of flour mix and two of milk. Beat until just smooth. Stir in white chocolate chips. Scoop batter into prepared muffin cups (12 w/ liners). Bake 22-26 minutes until golden brown. Let cool in pan on rack for 10 minutes. Remove from pan and cool completely. I tried two different fillings with these: King Soopers store brand of key lime pie filling as well as Trader Joe's Mango Butter. Both worked out great. I made straight up cream cheese frosting with butter. Here you go: 4 oz cream cheese (room temp), 1/2 cup butter (room temp), pinch salt, 2 1/4 cups sifted powdered sugar. Beat cream cheese, butter and salt until creamy. Beat in powdered sugar 1/2 cup at a time at a slow speed (or you'll end up wearing all the powdered sugar). Increase speed and beat until fluffy. I used a pastry bag to frost the cupcakes. Share with as many people as possible so that you don't hoard them all in your kitchen.